Including video on landing pages can increase conversion by 80 percent, according to a study by eyeviewdigital.com. So where will your video be played? This is an important factor to consider up front, as each distribution channel has its own requirements. A video on Vine, for example, can be no more than six seconds long. A video in Instagram Stories is capped at 15 seconds, but in the main Instagram feed can run to 60 seconds — and more, with the company’s newest initiative (see below). Your website: Your website is the perfect place for videos to explain your value proposition, and a headquarters where you can archive any training or vlog series. 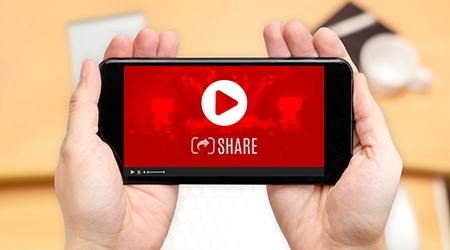 Videos on your site can run longer, and should be optimized for SEO as video is a key way to engage site visitors. Your social media efforts should also be in alignment to amplify your message, and your distribution. YouTube: YouTube is the second largest search engine on the web after Google (which owns it), processing three billion search requests in a month. With over 1 billion users and the opportunity to watch in over 76 languages, YouTube is a place you should assume your video will be played. If you do not have a channel yet, you may want to set one up now to leverage in the future. Facebook: Facebook’s pace is fast; if you plan to play your video here, keep it brief. The average video is only six seconds. Facebook is also global, with over a billion users — many of whom you’ll miss reaching unless you localize your video. Twitter: Twitter is another great way to promote your message—again, brevity is key, supporting your key branding message and steering viewers toward your preferred landing place. Key hashtags can help draw in members of your target audience even if they don’t follow you. Instagram: Think Instagram is a hangout for kids with pretty pictures? Think again. In June, the Facebook-owned company launched IGTV, a new app for watching long-form vertical video of up to 60 minutes. Longer clips are trending, according to Forbes, and if Instagram appeals to your target market, IGTV presents a new opportunity. When video is supported by a content management system and distributed across social channels, businesses are 168 percent more likely to be able to track lead sources down to specific content assets than non-distributed users (52 percent vs. 19 percent) — an insight that often requires data from multiple systems to discern. Creating a strategy upfront and thinking about distribution will save time and money, and maximize viewership of your video. At CMI, we work closely with clients to create video strategies that leverage the most video has to offer. Stay tuned for our next post where we’ll tackle video production as we share insights from the StudioNow team. In the meantime, how can we help you today?